One of the biggest heartaches of aging is the perceived loss of independence. When an older adult has to give up the car keys due to vision impairment or other safety issues, it’s a big adjustment. The wonderful news is that independence and the ability to get out and about is never truly lost, especially when you have a dedicated team of innovative care professionals by your side! At Innovative Senior Solutions, we recognized the need for safe, reliable senior transportation for our clients early on. We knew that our clients needed a way to get to our adult day health centers for care and companionship, and our home care clients needed assistance getting to and from doctors’ appointments, church visits or even to the hair salon for some pampering, so we started our own transportation division to help meet those needs and ensure that all our clients feel as independent as possible. 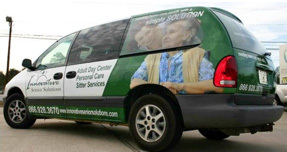 We provide senior transportation to and from our facilities for our adult day health center clients, as well as transportation to and from appointments and other requested destinations for our in-home care clients. Our clients’ safety is of the utmost importance to us, and we take the responsibility of their care very seriously. We thoroughly screen each of our drivers to ensure they have clean and clear driving records, and all our employees must pass thorough background and drug tests. Helping you and your loved ones stay active and engaged in the community is one of our main goals. To learn more about our senior transportation services, give us a call at 866.928.3670 or click the contact button below to contact us online.